The Miami Hurricanes came into the 1993 game against Colorado in Boulder with a 2-0 record, having only surrendered nine points in their first two contests. Miami’s record and dominant defense were not surprises. Over the previous ten seasons, the Hurricanes had posted four national championships, three near-misses, a 107-14 (89%) record, and a Top Ten ranking for 122 consecutive polls. Still, the Hurricanes, like the Buffs, were replacing a number of defensive starters. If the 2-1 Buffs were have any hope for a national title for themselves, it had to start with an upset win at home against Miami. The Buffs stormed back from a 28-6 deficit to pull within six points late in the game, 35-29, but could not score from inside the Hurricane 20-yard line with under one minute remaining. The hotly-contested game, played before 52,391 Colorado faithful and a national ABC television audience, was all Miami in the first half. The Hurricanes rolled to a 21-6 halftime lead behind the running of Miami fullback Donnell Bennett and the passing of quarterback Frank Costa. Still, despite what the scoreboard may have indicated, the Buffs did put up a fight in the first half of the contest. It just wasn’t while the clock was running. After a 25-yard touchdown pass from Frank Costa to C.T. Jones put Miami up 21-6 late in the second quarter, a bench-clearing brawl ensued on the Miami kickoff. Both teams were assessed personal fouls, and several players (including Buffs’ wide receiver Michael Westbrook and cornerback Dennis Collier) were ejected. The fight, which took place with only 20 seconds remaining in the first half, did not serve to immediately inspire the Buffs. With 10:07 remaining in the third quarter, the score stood at 28-6, Miami, after Costa hit receiver A.C. Tellison for a 37-yard score. With 8:50 remaining in the game, the score was 35-15, and there was no reason to believe that the Buffs could do anything but try to make the score respectable. Then the Buffs caught fire. Kordell Stewart teamed up with Charles E. Johnson on a seven-yard pass to cut the lead to 35-22 with 6:34 left. Everyone knew it was time for an on-sides kick. Although Miami was prepared, Mitch Berger’s pooch was recovered by Deren Tadlock and the Buffs had new life. Taking just five plays and only 1:29 off of the game clock, the Buffs marched 36 yards, culminating in a five-yard touchdown run by James Hill. The new score: 35-29, with just over five minutes still left to play. Needing the ball back as the Hurricanes chewed up the remaining clock, junior cornerback Chris Hudson came up with a huge play, stripping Miami running back James Stewart of the ball with 2:07 remaining. Folsom Field was in a frenzy … There was still plenty of time remaining to complete a miracle fourth quarter rally from a 20-point deficit. Stewart immediately hit Johnson for 22 yards, then connected with Lamont Warren for 25 more. First-and-ten at the Miami 17-yard line. After Rashaan Salaam gained six yards to the 11, the officials made the call of the game. Sophomore guard Heath Irwin was called for a very rare offensive face mask penalty, negating Salaam’s gain. The call resulted in an 18-yard loss in yardage to the Buffs. Three plays later, Stewart’s pass to Johnson inside the ten yard line was broken up, and the Buffs were 2-2. After the game, talk centered on the brawl and the officiating. Whether the loss was to be blamed on the officials or the defense, which was showing the signs of its lack of experience, the fact was that the Buffs were now 2-2 and out of the national championship hunt. Colorado’s schedule now allotted the Buffs a bye week to contemplate its future. The 1993 season was now reduced to “only” playing for the Big Eight Conference title. A little extra incentive could be found in the possibility that a conference title might very well result in a re-match with Miami in the Orange Bowl. I met Lee Stadtlander on March 5, 1993 … on a blind date. By July, Lee and I were talking about living together. When the football season kicked off, discussion of marriage had crept into our conversations. I had told Lee, though, (and only slightly tongue-in-cheek), that I would not/could not ask her to marry me until she had lived with me through a football season. My rationale was clear: I did not want there to be any misunderstandings as to my passion for Colorado football after we were engaged. If Lee could put up with me through a football campaign and still want to be around, I reasoned, then there would be no question as to our compatibility. One of the major hurdles was for Lee to go with me to a game in Boulder. Lee had been around me for brief periods while I watched the Texas and Stanford games on television, but there was no substitute for the real thing. Since Lee did not travel with me for the Baylor game, her first real test would be the war against Miami. Driving down from Bozeman, I was concerned about how Lee would react to my “participation” in a game in Boulder. Would she see an aspect to my persona which she would not find appealing? Heading into Folsom, though, I knew that I had a secret weapon … Brad. It was well known to all that had ever gone to a game with Brad and I that between the two of us, Brad was the true “fanatic”. While I fashioned myself as more stoic during games, Brad was not so restrained. My logic for the Miami game was that if Lee was concerned about my behavior at a game, at least I would look tame in comparison to Brad. And Brad did not disappoint. Long before kickoff, Brad was in fine form. Having seats down in the north end zone, we were placed in close proximity to the Miami fans who had made the trip to Boulder. During warm-ups, Brad laid into every Miami player warming up down on the field who came within earshot. Some of the players may have been academic All-Americans, but to Brad all Miami players were “criminals” (playing off of the Hurricanes’ well-established “bad boy” image). A small group of Miami fans, a few rows away from where we were seated, got up and left, presumably leaving to take refuge in the more visitor-friendly northwest corner of the stadium. And this was all before the opening kickoff. The game itself was exciting (at least in the second half), and Lee was treated to a good show. She didn’t show any signs of any second thoughts during or after the game, so it appeared that she had come to terms with my love of Colorado football. Two weeks later, well before the end of the 1993 season and the end of my self-imposed moratorium on engagement, I proposed. We were married the following July. – While it didn’t seem to be of much consolation at the time, two long field goals by Mitch Berger, including a season-best 54-yarder in the first quarter, kept Colorado in the game in the first half. Berger finished the game three-for-four on field goal attempts, with every attempt coming from 41 yards out or longer. Berger would go on to connect on 13-of-19 attempts on the season, earning All-Big Eight honorable mention. – Junior quarterback Kordell Stewart had a season-high in attempts (40) and completions (22) for 252 yards and a touchdown. – Junior cornerback Chris Hudson missed his only start of the season against Miami due to a sprained knee (though he did play in the second half, forcing a Miami fumble late). In his place, sophomore Dalton Simmons received his only start of the 1993 campaign. – The victory over Colorado was just the second all-time for Miami in the series, with the other victory coming in 1966. Colorado maintained a 5-2 overall edge, including a 31-21 victory over the Hurricanes in the 1967 Bluebonnet Bowl. – After escaping Boulder with a victory, Miami would go on, two weeks later, to fall 28-10 to No. 1 Florida State. A late season 17-14 loss to No. 9 West Virginia left 9-2 Miami with a Fiesta Bowl bid. A victory over Arizona would have meant an eighth straight season with at least ten victories, but the Wildcats humbled the Hurricanes, 29-0. The lost relegated 9-3 Miami to a No. 15 spot in the final polls, one spot ahead of Colorado. This post, about the Miami game, from the 1993 Season, is filed under Game. If anyone’s wondering when Chris Hudson strips the ball in the video, the play starts at the 2:48:32 mark in the video. (*Slight correction needed in this paragraph: “Then the Buffs caught fire. Kordell Stewart teamed up with Charles E. Johnson on a seven-yard pass to cut the lead to 35-22 with 6:34 left. Everyone knew it was time for an on-sides kick. Although Miami was prepared, Mitch Berger’s pooch was recovered by Deren Tadlock and the Buffs had new life. Taking just five plays and only 1:29 off of the game clock, the Buffs marched 36 yards, culminating in a five-yard touchdown run by James Hill.” 6:34 down to 5:04. Wouldn’t that be 1:30 exactly?) Also, the onside kick is at 2:31:51, the resulting touchdown is at 2:39:05. 1. Miami was itching for a fight from the get-go….during the pre-game warmups, we saw one of the Hurricanes purposely knock over a cheerleader! Wow, you really know you’re a thug when you have to beat up on 100-pound girls to assert your manhood. Little did we know at the time that it was just a sneak preview of things to come…. 2. During the brawl, a Miami fan turned to me and said: “You can’t just blame Miami, after all it takes two to fight.” Wow, if that’s an example of the education you get at Miami, I’m happy I went to CU! 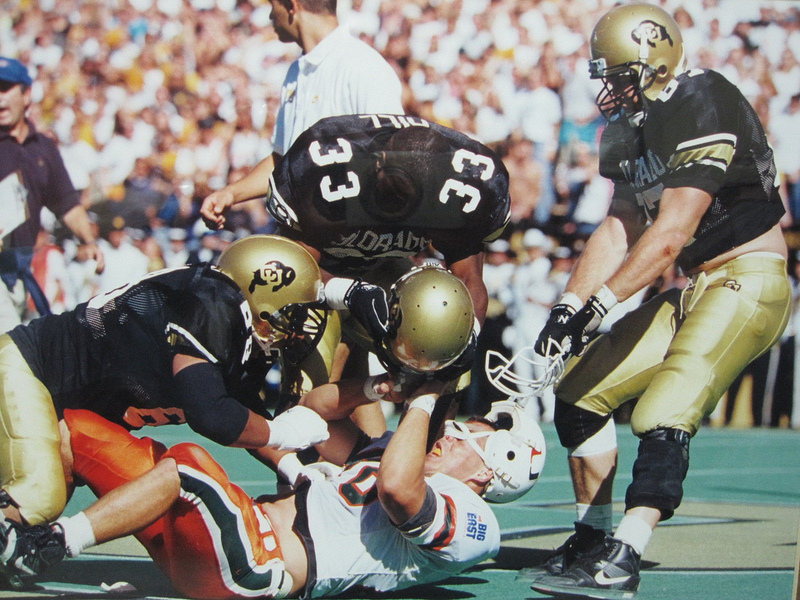 Let’s see….Miami has been involved in 2,836 brawls….CU was involved in ONE (which happened to be with Miami!). Tell me again who’s to blame? Colorado had more players arrested then Miami in that era. A third of the buffaloes championship team was arrested. Miami is a great University, if you knew anything about it. Many great things have been accomplished at the school, such as the Miami project, which you should read about. Wow – what a crazy memory for me on this game. Here I was, minding my own business and sitting with the rest of the CU drumline on the COLORADO in the horseshow getting ready to go on at halftime. Then all hell breaks loose. This was one of my first (or first) CU home games and I think to myself, “what the hell have I gotten myself into”. Pretty funny thinking back now. I’m talking to a buddy one minute, then I hear the crowd roar and see both teams swarm onto the field the next. It was all a blur until I saw two CU players literally ripping the facemask off a Miami player right in front of me in the endzone. A bunch of players started moving towards us and we all grab our drums and run for higher ground thinking they were coming over our way. I vividly remember looking over at the cheerleaders and seeing them egging on the crowd, almost telling them to jump onto the field and help. Finally, the fight ends and play resumes. I couldn’t tell you what happened after that. My parents taped the game and I must have watched their tape and YouTube videos a couple hundred times (you can see the drumline running for higher ground in the video). Good times! This game was a strong memory because it exemplified the quality of Chris Hudson, not just as a player but as a person. His strip with two minutes to go that gave the Buffs a chance would have been one of the biggest defensive plays in Buff history had they been able to convert the touchdown. Chris and I were both in the business school and had a few classes together. A few days after the game we were sitting in the small business school cafeteria talking and studying. People came up to him to congratulate him on the great play. To this day I remember how humble he was. From that and other experiences with Chris, I’ll always remember what a terrific person he was (it’s still hard to fathom that he and Michael Westbrook were roommates). I followed his NFL closely, but am not sure what he is up to today. I hope he’s doing well. I don’t think everyone even remembers that the Buffs lost this game 35-29 because of the brawl and Bill Marolt running on the field. I remember it because I was a beer vendor and this game was a big reason that they eventually stopped selling beer at Folsom Field. It was complete chaos as we tried exit out of the fill stations, into the packed hallways with two racks of 24 beers. We rarely made it out into the stands as we were immediately surrounded and hounded. Forget IDs or anything else! I just pushed cups and grabbed cash as fast as I could. It is amazing that I came up on the positive side of the exchanges, it was so crazy. There were fights going on all around the hallways and concourses even. I just tried to focus on the staying in one piece and unloading beers as fast as possible. I don’t remember exactly how much I sold but I do know it was the most racks I ever sold, and the most money I ever made, even though they cut off beer sales at halftime! I got out to the student section just in time to see the melee on the field and had a front row seat to Marolt’s antics. That was the most electric I have ever seen Folsom stadium, over any other night games, or even (I can’t believe I am saying/writing this) 62-36.